In the UK no one would bat an eyelid. In Atlanta, you could be wrestled to the ground. 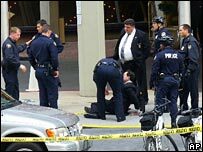 It is a cautionary tale for any traveller - distinguished historian Felipe Fernandez-Armesto tried to cross the road while in Atlanta for the conference of the American Historical Association, only to find himself in handcuffs and surrounded by armed police. "I come from a country where you can cross the road where you like," said the visiting professor of global environmental history at Queen Mary College, University of London. "It hadn't occurred to me that I wasn't allowed to cross the road between the two main conference venues." The bespectacled professor says he didn't realise the "rather intrusive young man" shouting that he shouldn't cross there was a policeman. "I thanked him for his advice and went on." The officer asked for identification. The professor asked for his, after which Officer Leonpacher told him he was under arrest and, the professor claims, kicked his legs from under him, pinned him to the ground and confiscated his box of peppermints. Professor Fernandez-Armesto then spent eight hours in the cells before the charges were dropped. He told the Times that his colleagues now regard him as "as a combination of Rambo, because it took five cops to pin me to the ground, and Perry Mason, because my eloquence before a judge obtained my immediate release". Not every jaywalking Brit abroad will be similarly blessed, nor enjoy the intervention of the city mayor. Just because you can do something in the UK doesn't mean it's OK in another country. 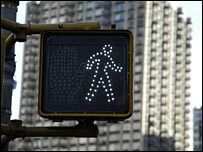 Jaywalking is an offence in most urban areas in the United States - although enforcement varies between states - and Canada, and in places such as Singapore, Spain, Poland, Slovenia and Australia. In Brisbane, police have begun doling out fines after complaints from motorists involved in near-misses with jaywalkers. In Beijing and Shanghai, city officials have clamped down on jaywalkers in an attempt to improve public behaviour ahead of the 2008 Olympics and 2010 World Expo respectively. But there is no such offence in the UK, where it is considered a personal responsibility to cross the road safely (although London mayor Ken Livingstone last summer proposed making jaywalking illegal). The Highway Code recommends that all pedestrians abide by the Green Cross Code: "Where there is a crossing nearby, use it. Otherwise choose a place where you can see clearly in all directions." In Germany and the Netherlands, the onus is more on the motorist. Not stopping for pedestrians on crossings is an offence, and a driver can be issued with a ticket even if they are waiting on the kerb (again, the expectation is that pedestrians should cross safely). Some road safety campaigners claim that with traffic heavier, where light phases are timed to allow as many vehicles through an intersection as possible, pedestrians are increasingly taking risks in order to cross the road. At least Prof Fernandez-Armesto can relax in the knowledge that it's not just outsiders who commit such heinous offences as crossing the road where they please. Back in 1915, the Atlanta Constitution reported that the practice of "jay walking" was all too commonplace. "People cross the streets any and everywhere, without regard to traffic, darting in front of fast-moving motor vehicles, dodging horses and street cars, and even braving ambulances and fire apparatus with no satisfaction except the consciousness that 'they did it,' and then having plenty of time to turn and contemplate the danger they have escaped." Having been carted off in a "filthy, foetid paddy wagon" as the professor described it, that last observation was one denied to him. I was in Aachen for a conference and was returning to the station with 15 others to catch the last train of the evening back to our hotel. The road outside the station was being resurfaced, and there was no obvious place to cross. But, half way across the road, a whistle blew and two German policemen came running to stop us. They gave us an on-the-spot fine of 10 euros each and told us to walk 100m up the road and round the corner, while they watched, to the nearest crossing. We ran, and only just managed to catch the train. There is some fascinating footage of a street scene in San Francisco in 1905 illustrating the point (to watch it, click here). Someone set a camera on a moving tram and simply let it run as it went down a busy street. It shows that if anything behaviour has improved in the past century. My wife and I were in Poland once and we crossed a totally empty road. The only vehicle in sight was a police van, which was not approaching us... until we crossed. The officers beckoned us over and began to give us a dressing down. However, as soon as they realised we were Johnny-foreigners, they eased off, explained that the rules were different and politely asked us to use designated crossing in future. Obviously the Polish police are more courteous than their US colleagues. The very same thing happened to me in LA in 2002. I was aware of the law but it was evening and unfortunately I didn't see that the car I had crossed in front of was a patrol car. I foolishly approached the car with my hands in my pockets, something one must never do in LA, and was commanded to stop immediately with my hands in the air. The cantankerous American officers were bamboozled by my foreign ID and whisked me off down to the station. I played the ignorant British teenager and was released back into downtown LA at 2am, unaware of my location and no means of getting home. It should be noted that the Netherlands legalised jaywalking in 1997. The effect on pedestrian fatalities was nil. More, fatalities in Germany and the Netherlands are a fraction of what they are in the US, despite walking trips being much more frequent. Given the very strict protection of pedestrians in those countries, it seems that motorists should be held to be considerate of their less well-protected partners on the roads in order to ensure the safety of all sides. Moscow 1975: dragged back to the pavement by students, so my wife and I were not arrested. Vienna, 1996 - occasional shouts, and fines for some friends walking across an empty intersection against a red man. I became more sympathetic when a woman said I was setting a bad example to her children - I should think of them, not myself. As a parent myself, touche! Budapest, 2007 - doesn't matter whether it is green or red, the motor-idiots always accelerate across red lights - after they have changed - but then take forever to accelerate away on green. Police action? Zero. Reminds me of a "true story" of a couple of years ago when seconded to work in Prague. One unfortunate British colleague crossed at a pedestrian crossing - no traffic but against the red man light. Not understanding Czech, he ignored the shouts of the local plod, who promptly shot him in the leg to catch his attention. Urban myth? Maybe, but I always tell the tale to visitors to make them more cautious when crossing roads... it usually works. It's true to an extent. The police out here do fine people for crossing against the red-light man (surely I'm forgetting some correct terminology). I've been pulled at 3am for crossing empty streets. But you aren't likely to get shot. I was in Honolulu recently and a cop called to me "Hey you, no jaywalkin' in future". I said OK and hurried off. I asked my hotel desk clerk what it was all about and he said that because of the anti-gay, repressive local authorities, walking in an effeminate manner had been outlawed. I spent the rest of my holiday walking like John Wayne and escaped police harassment. Now I know the truth! Bet the clerk had a right old hoot at my expense. I remember being in Luzern, Switzerland, waiting at the crossing of a barely used access road by the train station, together with about 10 locals. With not a car in sight, I strolled across - to the audible gasps of the people behind me. I turned around and one young woman exclaimed "it's red!" in German, with a look of utter disbelief on her face. 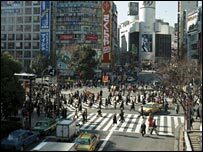 In Japan it is mandatory to follow the traffic regulations at the crossings, but there are levels of priority; a person walking is given a priority over the one using a bicycle, and a motorist usually stops for the walking person to cross. I'm from California but have lived in Costa Rica, Paris and Barcelona, and I do understand the US's jaywalking laws. Generally, the streets here are wider, so a saunter across 10m has a lot more risk than that of 4. In LA, people hardly recognize a pedestrian, and while they're babbling away on their cell phones, sipping Starbucks, and driving with their knees, the jaywalker doesn't have a chance. It's mostly about size. You don't see many native Parisians jaywalking the Etoile in Paris to get to the other side, either. Did they give him back his peppermints? I really object to the idea of not being allowed to cross the road where and when I deem it safe. I lived in Denmark and used to take great joy in crossing on a red light. Even when there was not a car in sight in any direction the Danes would shout at you and point to the red man. I object to not allowing jaywalking partly because the assumption is that the car is more important than the pedestrian - if the road is clear I should be able to cross. Now I live in Saigon where people just wander across between the moving motorbikes. Jaywalking is an essential way of life here, you might die waiting to cross the road! In the Philippines, as part of the government's effort to discourage jaywalking, they put up giant billboards at the centre of the road saying "BAWAL TUMAWID NAKAMAMATAY" (DO NOT CROSS, IT IS DEADLY). Ever tried crossing the main roads in Cairo? It looks hairy, but is actually very civilised and easy. Don't expect the traffic to slow down (it's moving pretty slowly and at a steady speed). Just walk steadily across the road between the cars. The drivers are the best I've seen anywhere, they know what you are going (and you know where they are going). I'm sure it does sometimes happen, but in all my years going there, I've never yet seen anyone hit by a car. I live in Switzerland where jaywalking is also illegal, although not really controlled. But if you get hit anywhere other than on a crossing, you would have no medical insurance. Visitors from the UK seem to think this is funny, and colloquial. Until they get the hospital bills. I find myself being looked on rather as a village idiot, when I wait for the green man at a crossing in England. But who is the real idiot? The biggest problem in the UK is the distance between crossings. It is a simple fact of life that people are essentially lazy and will not walk an extra 500m if they do not perceive that they should. I lived in Milan for many years. Over there if a pedestrian even looks like he wants to cross the road at a pedestrian crossing, motorists will accelerate so as not to let him through. Once I visited Moscow (in the old days of Brezhnev), and nearly got arrested for jaywalking. I wonder if they are still so strict, I have not been back since. In Sydney and Melbourne you are almost fined for not jaywalking, whereas in Brisbane, you can end up with a court appearance and almost a criminal conviction if caught jaywalking more than three times. Cars have too much control of the road, pedestrians are waiting longer and longer. The good professor should take a trip to Boston! He can cross anywhere he likes there, assuming he's willing to tempt the Massachusetts drivers. In the US, enforcement of jaywalking laws - and customs - can vary greatly, depending on the city and region. Visit NYC and you'll see that pedestrians can cross anywhere at anytime, regardless of traffic volume. Traffic tickets, forget jail, are as rare as the dodo bird. Travel 200 miles to Washington DC, however, and you'll find that stepping off the curb at an intersection, not to mention in the middle of a street, can result in honking and dirty stares from drivers. As an English expat resident in Hong Kong, I find the road crossing system most annoying at times. Jaywalking is an offence punishable by a fine, however it is very frustrating to be waiting by a roadside for five minutes for the lights to change and a not a single car has passed by. This is of course only true in the more rural areas of the city. I follow the old saying "when in Rome..." which means I cross when I please, just as the locals do. You can always spot American tourists in London as they're always the ones who hover nervously at the edge of the pavement, fearful to cross until the green man shows. Londoners of course just stride out purposefully regardless. This just confuses the Americans even more as they believe we're all patient folk who like nothing better than to queue endlessly. Your article is incorrect when it states "there is no such offence in the UK". Jaywalking is an offence in Northern Ireland (part of the UK), although it is rarely enforced. The enforcing of such is at the discretion of the observing officer. Enforcement usually results in the issuing of a £30 non-endorsable fixed penalty notice, however, may result in arrest and court prosecution eg: for failing to provide a satisfactory name and/or address. Jaywalking is not the only area where US police react excessively. I know of one colleague who found himself face down on the ground with a gun to his head after failing to come to a complete halt at a stop sign. Jaywalking illegal in Spain? I have yet to see any person, here, prosecuted for such an act. In fact cars often park on pedestrian crossings without being prosecuted. You also stated that a car in the Netherlands has to stop for a pedestrian. I would not want to ague with a car so I would wait. On my little Island, pedestrians can jump out in front of your car - if you are unlucky enough to hit one, then it's the car driver that will be arrested and charged. The Spanish police consider hitting a pedestrian (even if they've jumped into the path of your car) a very serious offence. God help any one that does it! Another example of how car is king in America. It's bad enough that cars don't slow down much near pedestrian crossings anyway with out such a ridiculous law in force. The car doesn't own the road, it should share it with a bit more consideration for others. So *that* is why the locals were honking their horns at me in San Francisco last autumn. I did wonder. Cheers Beeb. Yet another victimless "crime", another waste of police resources and time, and another way for the state/councils to extract money from us. Expect it to become law here.